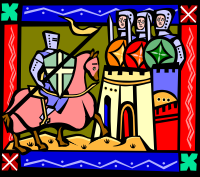 What do you know about life in the Middle Ages? This activity is about the feudal system in the Middle Ages. It covers material from Chapter 3 of LinguaFrame’s textbooks Geography and History – ESO 2 and Geography and History – ESO 2 Middle Ages, Population, Urban Areas.